Spring has sprung, and along with it has come the desire for something fresh and new. Although I have been loving the Revlon Nearly Naked Foundation for quite some time now, I feel that the time has come for something fresh, with a little more of a dewy, light and photo-ready finish! So I made my way to Sephora and I had the greatest experience!! I’ve never before had the same kind of service that I received at this location (Gardens Mall – Palm Beach Florida – yay I’m on vacation!!). So I tried the ever so innovative Colour IQ and after taking three pictures of my face the little device told me the perfect matches for my skin. My number was 2R05, and with that we found the closest foundation matches to my skin!! I’m a lover of liquid foundation, so taking powder foundations out of the mix my top match was the Clinique Superbalanced Makeup in the shade 01 Petal. 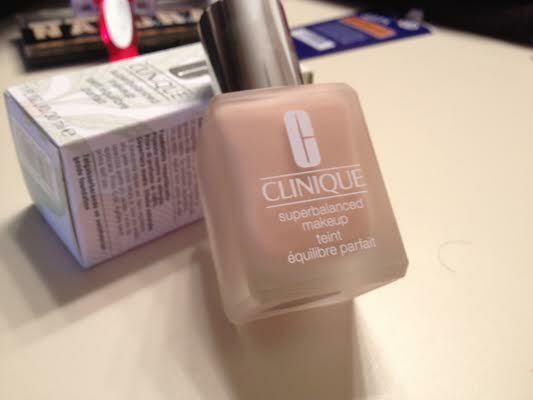 The Clinique Superbalanced Makeup is a perfectly blend-able liquid foundation that has quite a bit of skin conditioning properties. The shade 01 Petal is specifically for dry combination to combination oily/matte skin, and works to counter balance any of those inconsistencies. The foundation is allergy tested and is 100% fragrance free, which I love. Its still a pretty light-moderate coverage and has a very natural finish. The foundation formula absorbs oil where oil-control is needed and moisturizes where hydration is needed. It is also oil-free which is another thing I love. Although I don’t have very naturally oily skin, I’m always quite nervous to add more oils to my face. So I love oil-free formulas. It smooths on like a pair of perfectly fitting Lulu Wunderunders (my choice of pants on vacation has gotten out of control), and makes my face feel so soft and I just feel so pretty! Exactly what I needed for a great spring change!! Have you ever used Clinique Foundation? Or used the Sephora Colour IQ Foundation match? What is your favourite Sephora foundation?